Best Beloved Writers – thank you for all these books…! 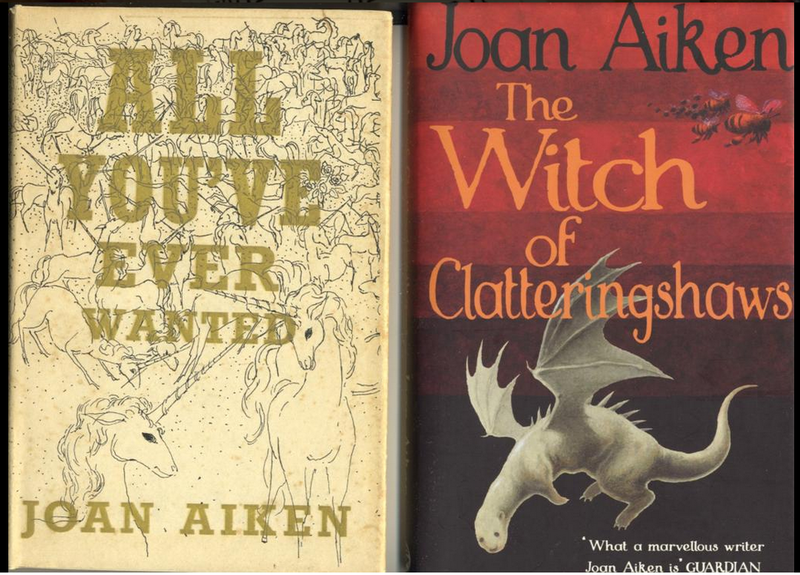 Joan Aiken was always a favourite of course – her first and her last. There have been a spate of ‘Top Ten’ children’s book lists lately, voted for by readers and critics, but all seem to go for the most well known, the ‘top’ titles by each author, whereas what I remember from my reading childhood are the writers. I remember the absolute delight of discovering a voice that spoke to me, took me away to another world, and even more wonderful, the moment when I discovered these writers had written other books… so I could go back to them again and again! Perhaps the earliest of these was Beatrix Potter – what a heavenly combination for me, a country child, of those familiar landscapes in her delicate but detailed illustrations, and endearing (or sometimes scary!) characters in stories told with such humour and rhythm – ‘I go barefoot, barefoot, barefoot’ or ‘pit pat waddle pat, pit pat waddle pat…’ a gift for readers aloud! An early hero was the bad cat Simpkin in The Tailor of Gloucester who got all my sympathy for being in the wrong but unable to explain himself. A brilliant short novel – it had everything! My next addictions were the coloured fairy books – Andrew Lang’s collections of stories from around the world, not many fairies, but every kind of myth and legend, and an original example of the inclusion of ‘found texts’ or ‘mediaeval’ illustrations – scraps of old documents, lost tales, ‘found’ fairy spells that now fill current historical fantasies from Philip Pullman to Chris Riddell. At the time I believed in them absolutely, maybe they were real? Other fairies, in particular the most wonderful fairy godmother were to be found in George MacDonald’s The Princess and the Goblin, transcendentally beautiful in her tower, with her purifying bath of stars and her fire of roses. All his books – The Golden Key, The Light Princess, still have the power to move me to another plane, such uplifting writing. I had a Canadian grandmother who was a postgraduate at Radcliffe, in Boston USA, where she heard talks by Sylvia Pankhurst and saw Sarah Bernhardt play Jeanne d’Arc. She taught my mother Joan Aiken at home until the age of twelve, and I inherited all their books – not just What Katy Did, but the books Katy herself might have read – Elizabeth Wetherell’s The Wide Wide World, or Gene Stratton Porter’s Girl of the Limberlost. Also I loved some of the Alcott heroines, like Rose from Eight Cousins, but I preferred the put-upon, struggling motherless girls, and the gruelling detail of their day to day American lives, a more grown up version of the fairy tale heroines with their wicked stepmothers perhaps, but excellent material for me as a would be orphan – or rather daughter of a desperately hard working single mother! Those girls are probably still my friends and role models, and I’m delighted to see their popularity endure. More stories followed – the now less known Eleanor Farjeon wrote two collections of stories set in my own Sussex countryside – Elsie Piddock who skipped on top of Mount Caburn to stop developers building houses there was another heroine, singing ‘Andy Spandy sugardy candy french almond rock’ – and is skipping there still for all we know… and Martin Pippin, the hapless hero sent to find his mislaid baby or his teasing wife in daisy field or apple orchard, and who could tell the old Sussex stories. A direct descendant of E.Nesbit, she went on to write one of my possible Desert Island favourites – a marvellous story collection called The Little Bookroom. Delightful dry humour came from T.H.White’s Sword in the Stone and The Witch in the Wood – I loved the witch wandering on the battlements looking up beauty remedies in a magazine called ‘Vague’ that she had obtained from the future, or the bunch of frightful boys – Agravaine, Gawaine, Gareth and Gaheris obstructing King Pellinore, as he followed a trail of fewmets in his hunt for the questing beast. I did finally (almost!) come into the present day with Philippa Pearce’s Tom’s Midnight Garden – why is this not on any list? It has a marvellous evocation of the past, but also for me was the first glimpse into the heart of a boy. Such a brilliant unfolding of the story, and what an ending when he meets his long lost love. Unforgettable. And at about the same time I discovered William Mayne, a couple of his books Underground Alley and A Parcel of Trees will continue to haunt me, with their mix of everyday life and elusive magic, as of course does his own unfortunate history and eventual disgrace. Noel Streatfeild of course was a regular standby – being a post war baby I identified strongly with the children who had to earn their own livings, preferably on the stage, or at a pinch as a bluebell girl in a circus, or playing Mary in a film of The Secret Garden, and of course with my passion for orphans I identified completely with the real Mary Lennox, and Frances Hodgson Burnett’s Little Princess, Sarah Crewe, making her quite shocking sudden poverty and loneliness more bearable by imagining the worse fate of a prisoner in the Bastille. The real joy of those books, was the suggestion that by using your imagination, changing your way of looking at the world, you could change your life. So I would find it completely impossible to make a list of top ten books – what I was lucky enough to have was a magical library from the past, which grew and expanded as I grew up, and which was continually added to, thanks to my mother’s own writing career and the work of her friends and contemporaries during another ‘golden age’ of children’s writing. …and there’s so much more, and it is so delightful…I’m sorry I’m going to have to go and read it again! 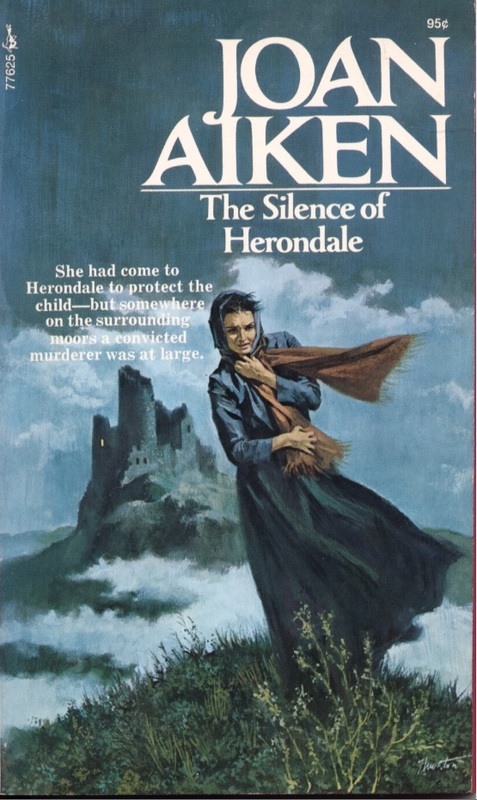 Utopian publisher seeks humane thrillers…from Joan Aiken of course! A thriller with humanity – a rare commodity nowadays perhaps, let alone a utopian publisher? 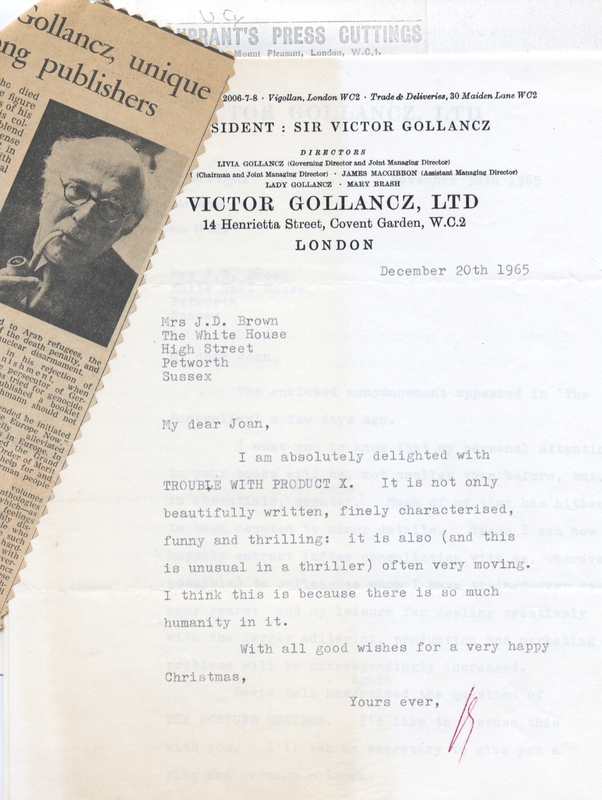 This charming letter from Victor Gollancz to Joan Aiken written 50 years ago shows the degree of warmth and encouragement she received from him in the early years of her career, and exemplifies the kind of devoted following she was to gather throughout her long writing life. Of course she already had another one up her sleeve; in fact her imagination was so fertile that from then on, she went on to produce as many as three books a year in every possible genre. “This thriller starts, as many Joan Aiken books do, with a heartbroken and misused young woman trying to move on with her life. This is Martha Gilroy, who works at a London advertising agency, writing snappy copy to sell soup and dishwashers. When a new client brings them an evocative new perfume, she unwisely suggests as a shooting location a remote Cornish castle where she spent her honeymoon with her husband before he had a nervous breakdown and left her. When the crew go down there and start working on the campaign- using Cara, the beautiful young Italian wife of the client as a model- problems start. The client doesn’t seem to be able to get the formula of the perfume quite right, the monks who live nearby oppose the filming, tins of soup explode with deadly force, a poisonous spider is mailed as a mysterious gift, a wealthy Sheik keeps dragging people out to the disco in the evenings, a baby is kidnapped, Martha’s friend Tom seems altogether too interested in Cara, the weather is dodgy, and who is the mysterious cowled monk who looks so familiar to Martha? Thrilling sequences include a creepy night-time chase around the perfume factory surrounded by the scent of violets, a gruelling escape to the monastery across the Cornish moors, and of course the patented Aiken Big Dramatic Finish where the heroine battles it out with the eeevil bad guy. It was only THIS WEEK that I realised she’d written books for adults as well. Naturally, I’m hooked once again. “Trouble with Product X” is beautifully written – Aiken could describe a person or landscape completely in just a few words – and crammed with twists in true murder mystery style. It may have been written in days of yore but it packs as much of a punch as anything produced today. Awesome. A Heroine’s Life…or a dog’s? In fact at this point it’s a slavering guard dog, not the villain of the piece that she’s worried about – there are still a choice of three or four contenders for top villain, so at this point it’s probably a good idea to make friends with the dog. Trapped in an isolated farmhouse on the Yorkshire moors our heroine Deborah, a young lady of no uncommon resources, and certainly not faint hearted, is grappling here with a diesel engine to get the power and lights on in aforementioned isolated farmhouse, and has also been left in charge of assorted geese, chickens and a runaway infant prodigy who may be lost on the snowy moors, but chiefly on her mind is an escaped prisoner possibly lurking nearby, cheerfully referred to on local news broadcasts as The Slipper Killer. Having had considerable success with her ‘Gothic’ children’s novel, The Wolves of Willoughby Chase Joan Aiken turned her talents to writing for adults – previously she had only published adult short stories for weekly or monthly magazines – and turned to the Romantic Gothic model popular in the 50’s & 60’s with alacrity. 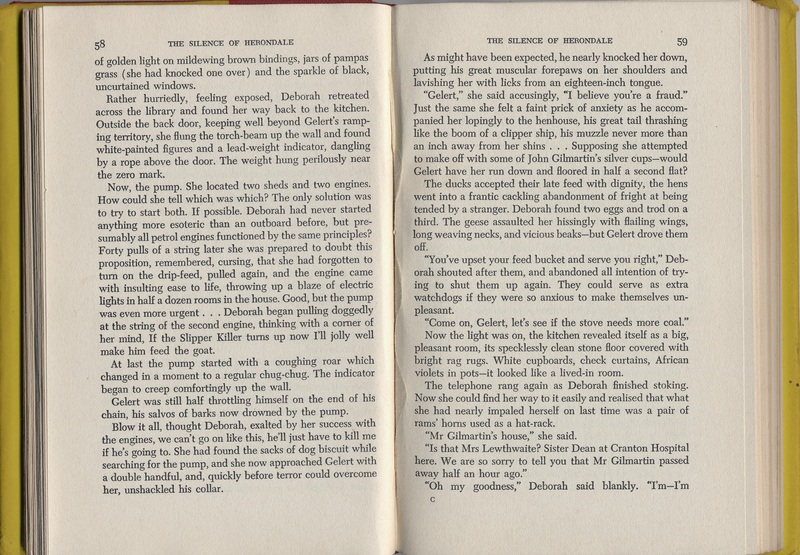 This gave the opportunity for pre-feminist heroines to demonstrate the resourcefulness and intelligence of the unshrinking violet – the girl who could look after herself, and usually the hero as well, and Joan Aiken’s own life had equipped her with plenty of practical experience of this kind as well as her writing skills. Widowed with two small children and left homeless and in debt after her husband’s early death, she needed a whole range of practical and literary skills to keep the family afloat. 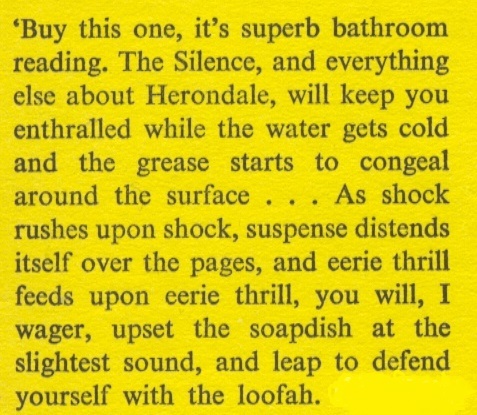 By 1964, when this novel, The Silence of Herondale was published she was finally beginning to make a living from her writing, so no wonder she put absolutely everything into it. Out of print for too long, this wonderfully entertaining and hair raising read is coming back in December courtesy of Orion’s The Murder Room EBook Library as part of a series of Joan Aiken adult titles. Look out for them all – and give yourself some cheerful winter thrills! Click on book above to read this excerpt!